Cirque du Soleil are now celebrating 20 years at Royal Albert Hall, and Amaluna invites the audience to a mysterious island governed by Goddesses and guided by the cycles of the moon. Their queen, Prospera, directs her daughter Miranda's coming-of-age ceremony in a rite that honours femininity, renewal, rebirth and balance which marks the passing of these insights and values from one generation to the next. In the wake of a storm caused by Prospera, a group of young men lands on the island, triggering an epic, emotional story of love between Miranda and a brave young suitor, Romeo. But theirs is a love that will be put to the test. The couple must face numerous demanding trials and overcome daunting setbacks before they can achieve mutual trust, faith and harmony. So, that's the storyline out of the way, and it is the underlying basis of some phenomenal human circus skills, which leave you in awe and gasping in amazement. You've heard the phrase 'Jumping through hoops'? Well, the first act is just that, the 'Lizards' of the island jump through them, and they keep getting higher. 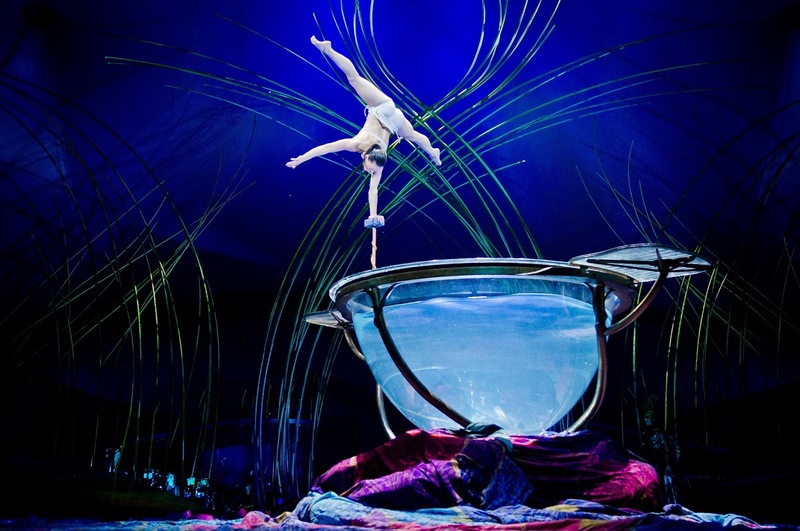 This is followed by some aerial work, where the artists fly out over the audience on straps, suspended from an automated carousel, a rotating set element high above them. The skill and strength to move at high speeds at the same time as each other is immense. Superb aerial work from Virginie Canovas, Sarah Hardy, Andréanne Nadeau & Haley Viloria. There's a Peacock Dance showing some nice contemporary work, followed by the Moon Goddess (Marie-Michelle Faber) entering on a Cerceau and implementing the huge Waterbowl. Romeo (Evgeny Kurkin) watches as Miranda (Iullia Mykhailova) plays in the waterbowl, and we discover her challenging hand-balancing routine before diving and snaking through the water. He joins her in the water, where they innocently play and tentatively kiss for the first time... Meanwhile, the captured young men from earlier help the Amazons – the fierce feminine force of the island – to present a fast-paced theatrical version of the classic gymnastic routine - the uneven bars. While the different routines are being set up, there is a clown act - Romeo’s manservant Papulya arrives with the young men and promptly falls headover-heels in love with Maïnha, Miranda’s childhood nurse - cue the chasing around the auditorium for some slapstick moments and silliness. Act two starts with a Teeterboard routine, some of the heights they reach and landings they make is ridiculously good. Then this is followed by an act called Manipulation - Prospera brings Romeo and Miranda to witness the Balance Goddess (Lara Jacobs Rigolo) creating a world in equilibrium with a mobile made of thirteen palm leaf ribs. An ode to balance, her movements are slow, deliberate and the place is silent except from her breathing as all our attention is on this literally breathtaking structure. And when she removes the smallest piece, everything disintegrates and the young couple’s trials begin. Then theres more dancing, a great juggling act from the half human - half lizard 'Cali' (Viktor Kee), more acrobatics where performers lie on their back and flip, twirl and spin another performer on their feet - then it's the finale of all the acts and more aerialists to a standing ovation from the crowd of the Royal Albert Hall. The band sound fabulous throughout, with some haunting music at times written by Guy Dubuc and Marc Lessard (aka Bob & Bill). The Amazonian set is simple yet effective, designed by Scott Pask along with costumes from Mérédith Caron, and beautifully lit by Matthieu Larivée. 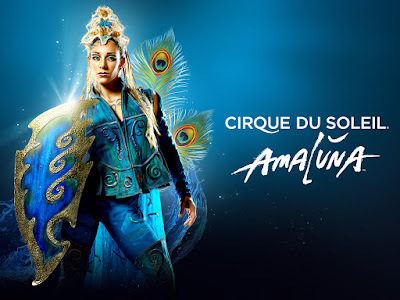 Another fabulous show from Cirque du Soleil which is jaw-droppingly good.